*UPDATE* The postal strike has been called off but we are so happy that things are back to normal that we are continuing the special offer until midnight on Friday, October 9th 2015! The last thing I wanted to hear on a Friday afternoon was unexpected news of a postal strike. On the 2nd of October, An Post (the Irish Postal service) advised customers not to post any mail until further notice and there I was with a box full of UK and international orders ready to go! I weighed up my options and decided that "Little White Dog's customers not getting their orders on time" was not a viable option. A little bit of internet research told me that there was a Post Office just across the border in Northern Ireland which was open until 9pm on Fridays. So we popped all the parcels into the car and headed for Newry, Co. Down to send them with Royal Mail. We arrived at 8pm (in plenty of time! yay!) only to be told that there was a mistake on the website and that the post office actually closes at 5.30 every day (no-no-noooo! We just drove 130 kilometres from Dublin to get here!). Back into the car with all the parcels (sigh!). A bit more internet research told us that there was another Post Office 30 kilometres away that was open until 10pm (ah sure, we're here anyway so we may as well give it a try). We arrived at a supermarket in Newtownhamilton a while later not really expecting this story to end happily at all. The little Post Office kiosk in the corner of the shop was dark and empty (hmmm, I thought as much) but then the shop assistant at the main counter said "I'll just get someone to open the Post Office for you now". A very kind and patient post mistress appeared and helped me to work out the right options for sending each of the parcels. Off they all went on their merry way to their destinations, and off we went on ours back home to Dublin (phew!). Hopefully the strike at An Post will be resolved quickly, but there is a possibility that it will last for up to two weeks. In the meantime Little White Dog will be taking orders almost as normal. What do I mean by "almost "? Well, orders will be dispatched on Wednesday afternoons and Friday afternoons only. International orders will be sent via Royal Mail and Irish orders will be delivered by courier. 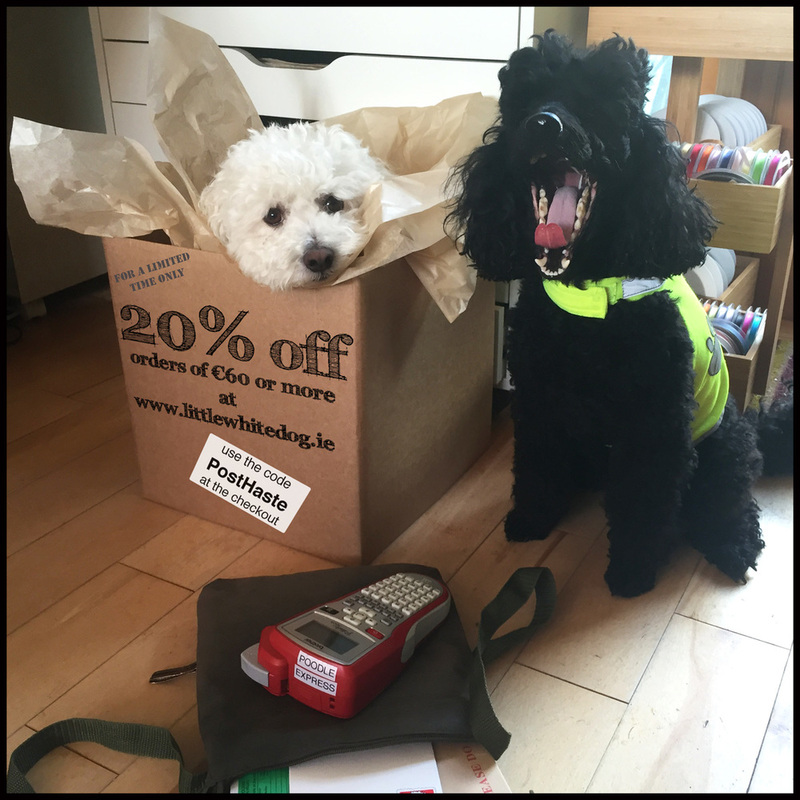 Most importantly though, we are offering 20% off orders of €60 or more on www.littlewhitedog.ie while the An Post service is shut down! Just use the code PostHaste at the checkout. This is a bit unusual because we don't usually have sales or special offers here at Little White Dog and I don't have any plans to make it a regular thing. This offer will only last until I can start sending our mail with An Post again, which might be tomorrow or it might be in two weeks time, who knows? You might be wondering whether we're offering 20% off but then charging you an arm and a leg for postage. Not at all! Our standard postal charges will stay the same. Standard delivery within Ireland is free but might take a day or two longer (3-4 days from dispatch rather than 1-2). International delivery charges and estimated delivery times will stay the same (free standard delivery to the UK, USA, Canada, Australia, New Zealand and most European locations, and €3.00 for the rest of the world). Tracked international delivery is also available for an additional fee. Click here for more information about delivery times and making times for specific products. So, if you have a special occasion coming up (an engagement, a wedding, a birthday or even Christmas... is it too early to plan ahead for Valentine's day? I think not) and you would like to order a gift from Little White Dog then now is a very, very good time to do it. Tell your friends, tell your family! On the other hand if you are one of our customers for whom Little White Dog is the secret weapon in your gift giving arsenal then sshhhhh, quietly avail of this rather lovely offer and tell no one, you sly fox, you. If you have any questions at all about our products, delivery, specific map locations for map art products or anything at all* you can contact me (Suzie) here. *Such as any concerns, questions or suggestions you may have about the fact that I have a little black dog (Holly) as well as a little white dog (Milo) but that Holly doesn't seem to have a website named after her! This issue gets raised quite a lot actually.